Ownership: Cove Harbour Conservation Ltd.
From at least the 1600s use was made of a natural harbour at Cove. In 1740 the first of several attempts was made to clear the basin and an access road was built. The present harbour was completed in 1831. The harbour, pier and breakwater, pier cottages and stores, and tunnel entrance, are all listed as structures of architectural and historical interest. Access to the beach is via the tunnel, cut through the rock in the 1700s. Cellars leading off the tunnel were used to store fresh salmon and herring as well as cured and barrelled white fish. More recently, bathers also used the cellars for changing until they were closed off in 1981. In 1794 there were 16 Cove fishermen, fathers and sons, but after the new harbour was completed the population increased to 20 families and remained at that level until 1920 when the industry started to decline. Two fishing boats, the Ocean Crest and the Telstar are based at Cove, setting creels for lobster and crab. Visually the harbour and its cottages are much as they were in the 1800s when they attracted ‘The Glasgow Boys’ and other artists. In more recent years film makers have discovered it as a setting for films such as A Tour of the Western Isles and Mrs Brown. Cove harbour has been privately owned since 1991, when Ben Tindall bought the harbour and cottages from Borders Regional Council as a means of saving it from being developed as a marina and holiday resort. Ben has a long family association with the harbour. 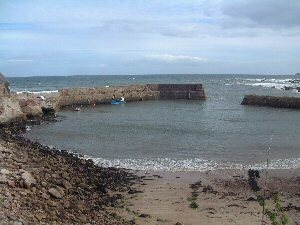 Cove Harbour was built in the late 18th century by the enlightened Hall family of Dunglass estate. It was built to facilitate the transportation by boat of the coal which was mined there. Coal was that time was an extremely valuable resource, and the investment needed to construct the harbour and mine the coal is well documented. The present harbour is the result of the third attempt to construct a harbour, earlier attempts having proved too vulnerable to sea storms. Traces remain, inscribed in the rocks, evidence of earlier attempts. The two piers are beautifully built and enclose what appears to be a picturesque fishing port, and it came as a surprise to some of us to learn of its industrial origins. Interesting details include a number of dove-tailed stones set into the harbour walls which originally held timbers which acted as buffers for the boats moored there. Coal seams were mined from two tunnels; the first started from the harbour side and is now blocked up; the second tunnel entrance is behind the cottages off the rocky foreshore. The harbour and surroundings are designated an area of Special Scientific Interest because of its unique geology. To a lay eye, the sculptured rocks around Cove are indeed unusual and exciting. The advent of the railway brought an alternative and more reliable form of transporting coal and Cove declined in importance as a mining area. Today, it still harbours local fishing boats, and provides inspiration to a wide range of visitors whether artist, geologist, walker or historian.